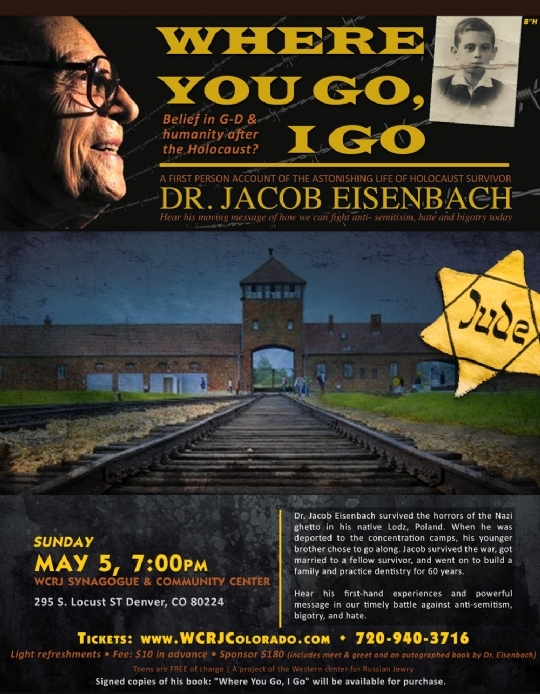 The WCRJ Synagogue welcomes Dr. Jacob Eisenbach as guest speaker on Sunday, May 5th at the WCRJ. DR. EISENBACH'S ASTONISHING STORY OF HOLOCAUST SURVIVAL SERVES AS A POWERFUL MESSAGE IN OUR TIMELY BATTLE AGAINST ANTI-SEMITISM, BIGOTRY AND HATE. Jacob is a 96 year old survivor who recently retired from his dentistry practice in California. He retired from dentistry in 2015 at the age of 92, after practicing for 60 years. He immigrated to the United States in 1950 with his wife and first born child. He will discuss his astonishing life as a young man while in the grip of Hitler’s Third Reich, and how hatred, discrimination and intolerance led directly to the Holocaust. He is the sole survivor of a loving extended family of 100. His message is relevant and pertinent for adults and especially teens. His remarkable life and story impresses upon his audience the need to take action and be proud of who we are. Signed copies of his book: "Where You Go, I Go" will be available for purchase.